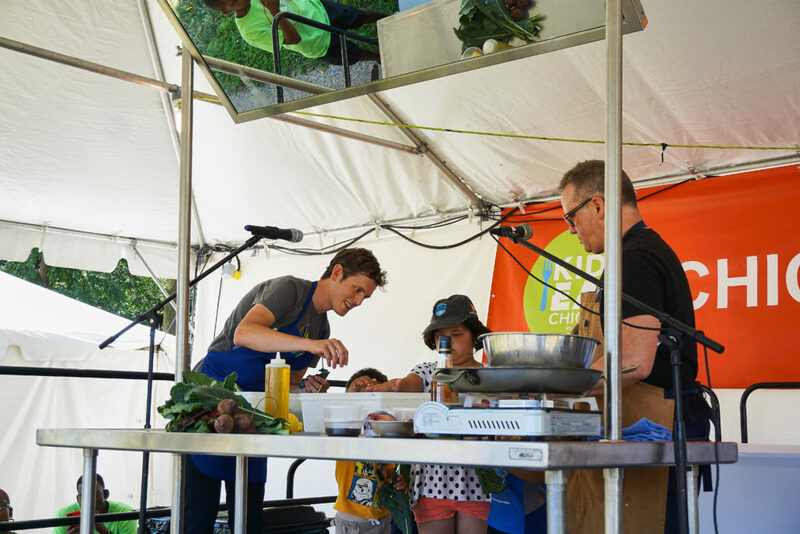 Pilot Light is a nonprofit organization founded by some of Chicago’s top Good Food chefs to bring food education to students in Chicago Public Schools. 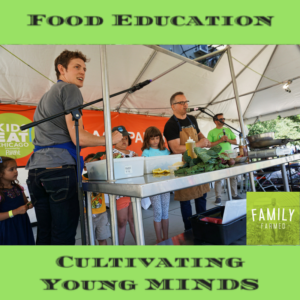 Its aim is to improve food literacy and help children make healthier choices, and they do so by working with educators to integrate lessons about food and its role in society into the overall curriculum. And even though school’s out for the summer, Pilot Light is doing events around town to spread the word about its important social mission. 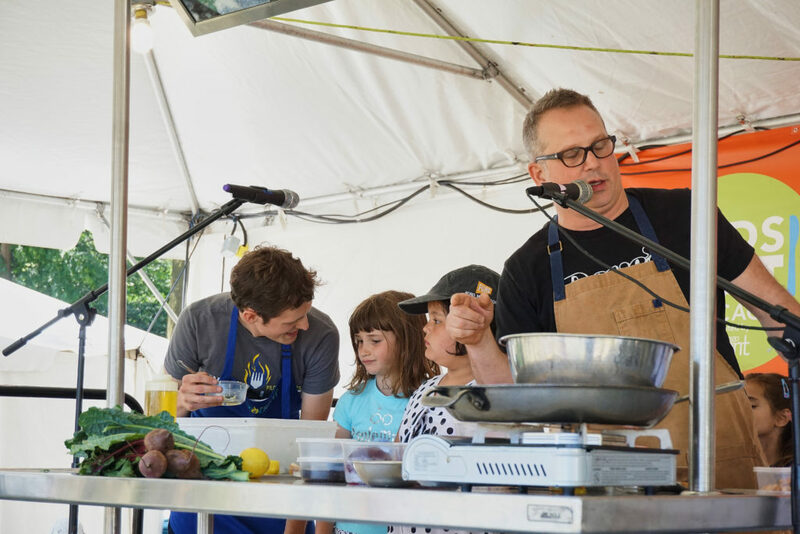 That’s why Paul Kahan — the James Beard Foundation Award winner who co-founded Pilot Light in 2010 with fellow chefs Matthew Merges, Jason Hammel and others — was on the kids’ stage Saturday (July 8) at the annual Taste of Chicago mega-event doing a demo with Justin Behlke, a young chef recently hired as Pilot Light’s new culinary director. 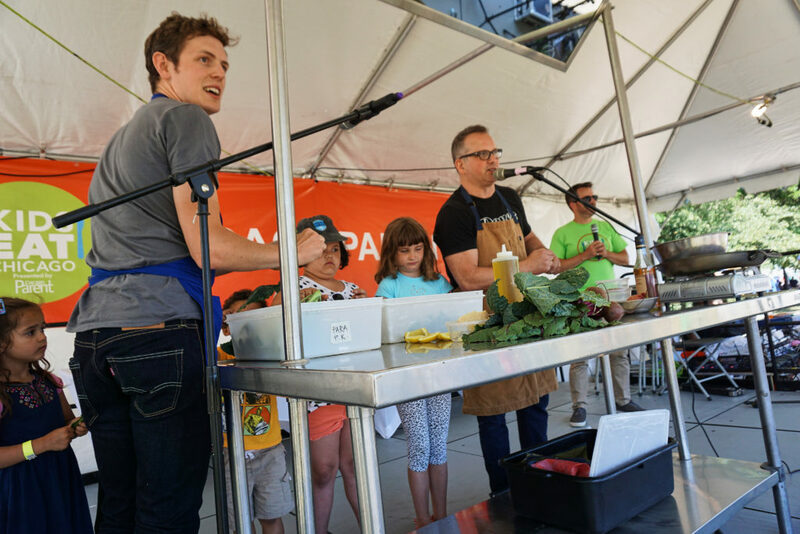 The official tasters were seven very little children invited up on stage from the audience. This made the sophisticated dish that Paul and Justin prepared — charred beets with burrata and marinated kale — a bit daring. But their delicious veggie presentation won unanimous thumbs up, even from one girl (in the light blue shirt in the photos) who initially said the plain beet she had tasted was yucky. 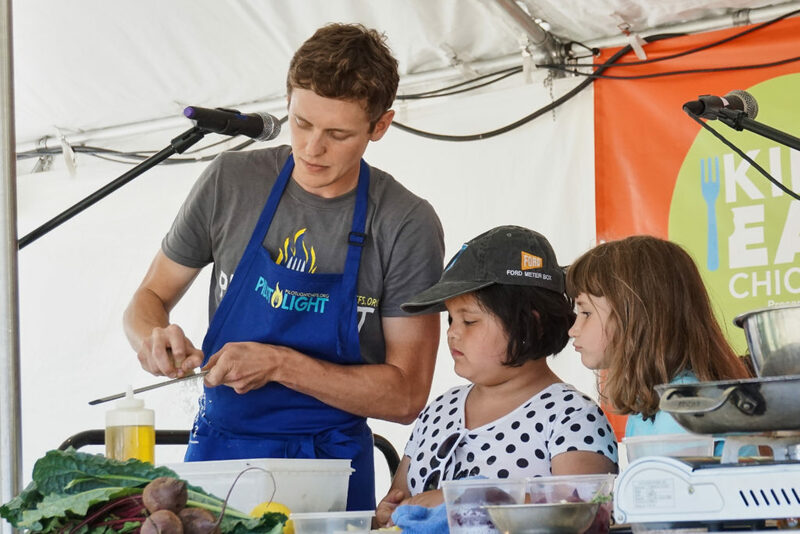 Pilot Light will resume its work with teachers this fall, which includes regularly scheduled classroom visits by participating chefs who teach age-appropriate lessons to kids at the different grade levels. Along with adding Justin as a full-time staffer to expand the program’s reach, Pilot Light is adding eight schools to its lineup for the next school year, more than doubling the total to 14. All of the new schools are located in underserved communities on Chicago’s South Side. 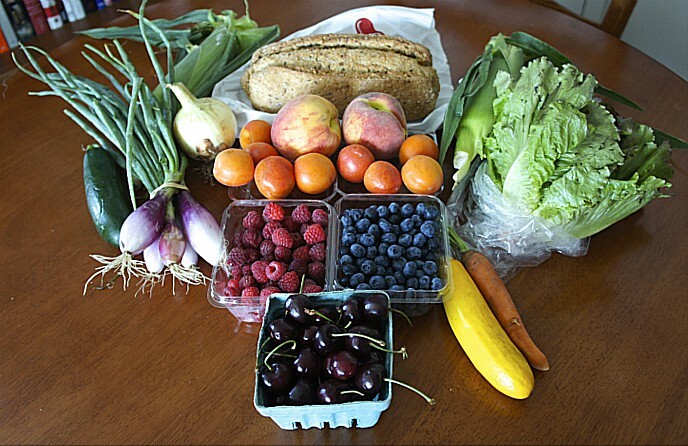 FamilyFarmed strongly believes that it is vital to instill Good Food values in our youngest eaters, so they develop lifelong healthy eating habits and an appreciation for food grown with sustainable, humane and fair practices. Our organization helped get sustainably produced local chicken and produce into Chicago Public Schools, and also produced a school garden manual for CPS use. That’s why we strongly support the efforts of Pilot Light, which has participated in our Good Food Festival & Conference (now the Good Food Expo) multiple times. Links to Good Food on Every Table articles about the program and its leaders are located below these photos of great chefs and cute kids from the Taste of Chicago event. All photographs ©Bob Benenson/FamilyFarmed. 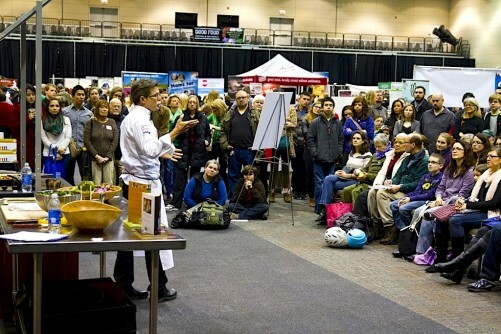 This entry was posted in Chef activism, Chef advocacy, Child nutrition and health, Farm to school movement, Food access, Food activism, Food education, Good Food Festivals, Healthy eating for children, School food, Sustainable food education and tagged Chef Jason Hammel, Chef Justin Behlke, Chef Matthias Merges, Chef Paul Kahan, Chicago Public Schools, FamilyFarmed, Good Food Expo, Good Food Festival & Conference, Honey Butter Fried Chicken, James Beard Foundation, Pilot Light. Bookmark the permalink.